Zimbabwean President Robert Mugabe, left, and Chinese Premier Li Keqiang pose for photographers prior to their meeting at the Great Hall of the People in Beijing, Aug. 26, 2014. Zimbabwean President Robert Mugabe is in China on a five-day state visit. The trip comes after he was snubbed by U.S. President Barack Obama, who did not invite him to the recent U.S.-Africa summit. The longtime leader is reportedly seeking a $4 billion financial boost for his nation’s struggling economy. Mugabe has long been known for his fiery, combative anti-Western rhetoric. And so, as he ventured east this week for a five-day state visit to China, the host government greeted him with a 21-gun salute. Members of Mugabe’s delegation on Monday signed a bevy of agreements with Chinese officials, though the details of the agreements were not released. Chinese President Xi Jinping, left, walks with Zimbabwe's President Robert Mugabe during a welcome ceremony outside the Great Hall of the People in Beijing, China, Aug. 25, 2014. It’s an increasingly rare welcome for a leader who has fewer and fewer places to turn. He and many members of his inner circle face strict sanctions and travel bans from the West for years of alleged election rigging and human rights abuses. Earlier this year, first lady Grace Mugabe was denied a visa for a trip to the EU, and earlier this month, U.S. President Barack Obama pointedly left Mugabe off the guest list for a summit of African leaders. Yejoo Kim, a research analyst at the Centre for Chinese Studies at Stellenbosch University in South Africa, says the Zimbabwe-China friendship is not new -- Mugabe sought support from China during Zimbabwe’s independence struggle in the late 1970s. 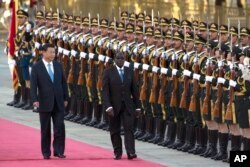 “Actually this is not the first time for Mugabe to visit China. As we all know, Zimbabwe not invited to attend the U.S. this year, in August. So even before the U.S. and the EU imposed sanctions against Mugabe, he had developed a 'look east' policy,” she said. But Mugabe needs more than friendship. Zimbabwe’s economy is once again in turmoil, with widespread power outages and reports of companies being forced to close or stop paying employees. Zimbabwean media have reported that Mugabe is asking Chinese leaders for $4 billion. Mugabe’s spokesman did not answer repeated calls seeking comment on the reports. Kim said that the two nations have long had financial ties, with a number of Chinese mining and construction firms already working in Zimbabwe. “The country has to find another economic opportunity from other countries, say, from Asia. And considering Zimbabwe has been suffering from economic stagnation, China is giving the country a great opportunity, that’s why Mugabe has to visit China, actually,” she said. But, Kim said, if Zimbabwe got the money it sought, there would be a price. Zimbabwe is rich in natural resources like minerals, timber and metals -- making it a potentially lucrative investment for China.